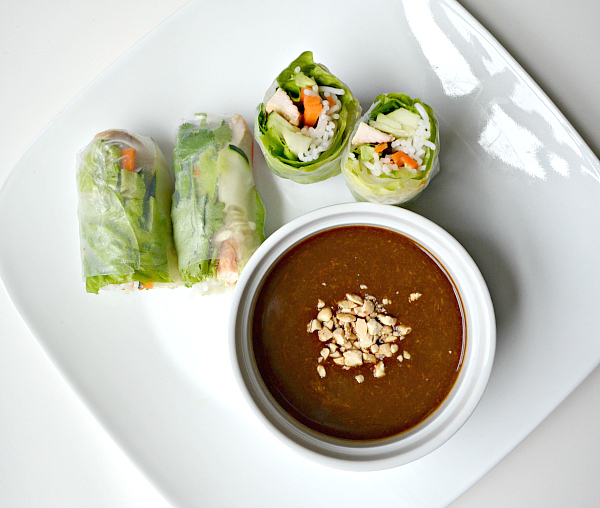 Gỏi cuốn, or Vietnamese spring rolls, are one of my favorite Vietnamese dishes to eat! These light delights are stuffed with veggies. They consist of pork, shrimp, rice noodles, red leaf lettuce, cucumber, cilantro, and green onion wrapped in rice paper. For a slight Teresa Thuy twist, I replace the pork and shrimp with chicken and add carrots for extra crunch and pop of color and avocado for some healthy monounsaturated fats and fiber. Let's get rollin'! 2. Combine the rice vinegar, soy sauce, brown sugar, and garlic in a large bowl. Add the chicken and let marinade for 10 minutes. 3. Line the bottom of a baking pan with parchment paper. Place the chicken breast on the paper and bake for 25 minutes. 4. Bring water in a pot to a boil. Cook the rice vermicelli noodles, as directed on the package. 5. Cut the vegetables and avocado, and separate the lettuce leaves. 6. To make the dipping sauce, mix the hoisin sauce, chicken broth, and peanut butter well. Crush the peanuts and sprinkle on top. This dipping sauce was adapted from Helen's Recipes. My mom loves her recipes! I omit the oil, sugar, and garlic. 7. Once the chicken is done, slice into half inch slices. 8. Heat a bowl of water for two minutes in the microwave. This water is used to immerse each rice paper for a few seconds. Now, it is time to dig in! Bring all of the ingredients to the center of the table for everyone to enjoy family-style. You want to roll one and eat it, before rolling your next. How do I roll? At the top of the rice paper, I start off with 1-2 leaves of lettuce. Top that with noodles. Then, I add a few slices of cucumber, 2 slices of avocado, 2 slices of chicken, some carrots, and cilantro. I hope you enjoy these spring rolls! Please, let me know what you think of them! :) You can find more recipes in the Food section of my blog.